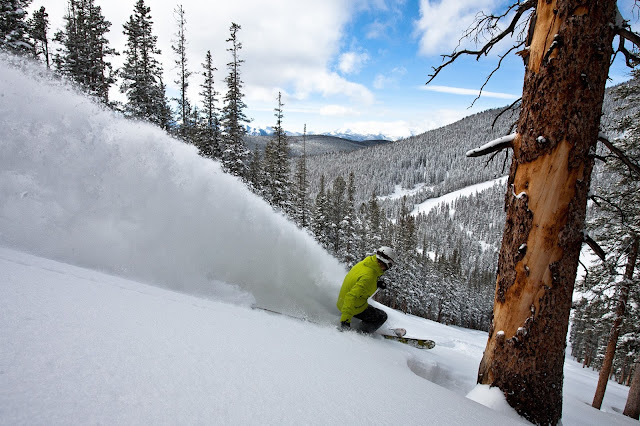 Definitely Photo of the Week - looks like spring but actually was the first day of the season at Purgatory, Colorado! 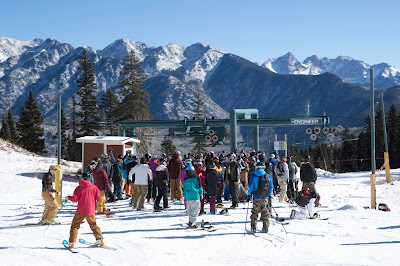 Skiers and snowboarders started lining up at 5am at Purgatory, some even cooking bacon and eggs on the 'ski beach' in anticipation of making first chair. The Southwestern resort celebrated opening day of the ski season with a unique offering - skiing and mountain biking. Lifts 1 and 2 are open for skiing and Lift 4 was utilized for lift-served mountain bike trails opening weekend. What's New: Coming in 2018, Purgatory will feature a new mountain coaster - the latest hip ski resort accessory -accessible right from the base area. Located just north of the Twilight Lift 4, the coaster will operate during both winter and summer seasons. It will be 4,000 feet in length with a 300 foot-vertical, featuring nine switchbacks and one loop. Construction work has already begun on the mountain coaster project and it's expected to open in 2018. Purgatory added new intermediate and expert trails on the back and front sides of the mountain, including new gladed tree skiing terrain. The front-side new trail names are Monkey Brains, Tribulation, Brimstone, and Sheol, in keeping with Purgatory’s theme from Dante's Divine Comedy. A new trail will open this winter, named Major Fun after long-time employee Major LeFebvre on the back-side in the Legends section of the mountain. The triple chairlift, Needles Lift 6, will offer a new mid-way loading zone that provides an easier way to access terrain for ski teams, terrain park users, and skiers/riders who want to make laps on the upper half of the mountain. 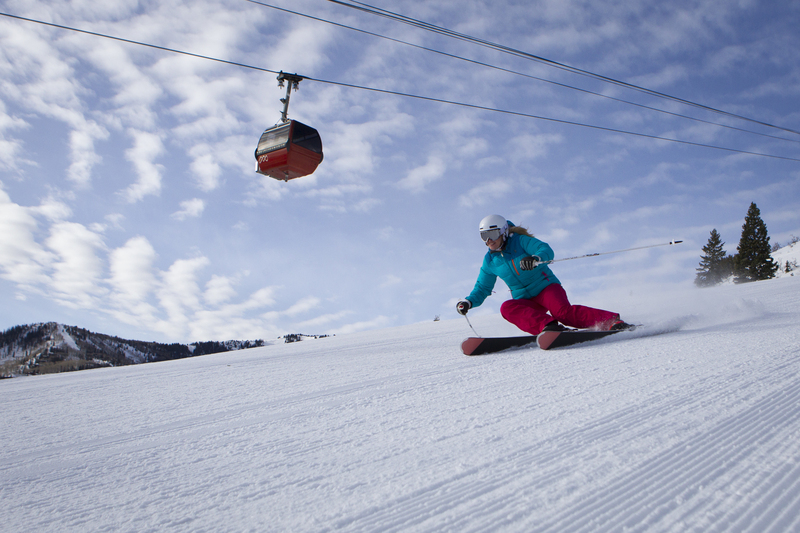 A new magic carpet lift will open in the Columbine beginner area, offering beginners an easier way to learn the sport. These projects are all part of a $15 million multi-mountain capital improvement plan for five resorts during the 2017/2018 season that was announced earlier this year by resort officials with the largest ski area collective in the Southwest. 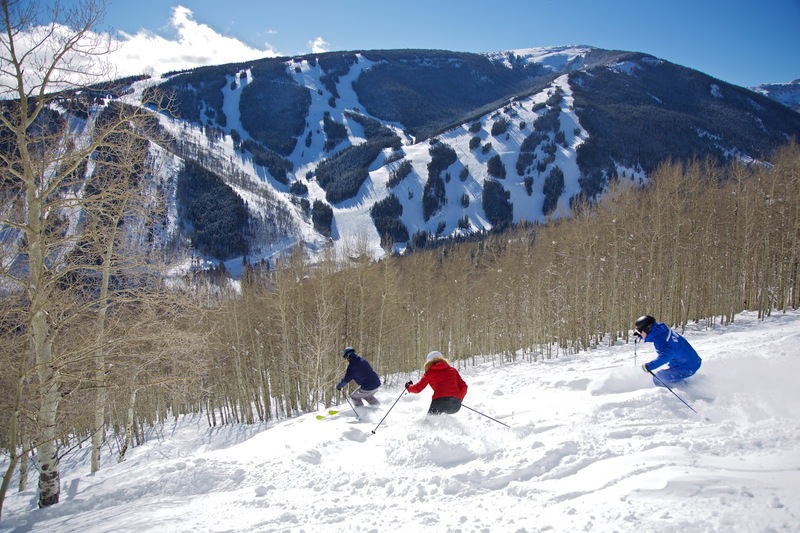 The five mountains include: Purgatory Resort, Arizona Snowbowl, Sipapu Ski & Summer Resort, Pajarito Mountain, Hesperus Ski Area, and Purgatory Snowcat Adventures. Always exciting to see what Vail Resorts is up to! This winter ski fanatics are one trail closer to the holy grail of powder runs with Vail Resorts' latest innovation: EpicMix Time Insight. The new platform allows users to look at previous lift line patterns from the 2016/17 season to carve out their own future-perfect ski vacation at Vail, BeaverCreek, Breckenridge, Keystone and Park City. The benefit? You can already maximize your day of skiing and snowboarding with these mountain metrics when vacation planning. It also tracks daily snowfall and offers tips designed to navigate and maximize the mountain. Next up? The EpicMix Time Insight website will work in tandem to determine where lift upgrades are needed for seasons ahead. No-one could fail to love Vail! I've skied there twice over the past eight years, staying once at Lionshead Village at the amazing Arrabelle and the second time right in the centre of things at the fancy Four Seasons, complete with skis and boot concierge by the slopes. My first experience of having someone offer to help put your ski boots on! Out of the embarrassment of potentially smelly, and even holey, socks, I declined. This was before I discovered the joys of Smartwool's merino. A Taste of Vail with Check-In Sips courtesy of Vail Brewing Co. at Vail Marriott Mountain Resort at the base of Vail Mountain. The resort also features 10th Mountain Whiskey's daily expert-led whiskey sampling with free branded takeaway glasses. Altitude Recovery Kits from The Lodge at Vail, A RockResort and The Arrabelle at Vail Square, A RockResort (celebrating its ten year anniversary this Jan). For $50 you get 20 minutes of oxygen, peppermint oil foot rub, and altitude sickness tablets. Decadent doggie daycare at The Arrabelle at Vail Square - Homemade doggie treats and personal water bowl; plush red velvet pet beds, embroidered with the pet’s name for an additional cost (and soon to be available to ship home — the ultimate souvenir); Midday walk service; Fit Barks — a Fitbit for dogs that tracks activity and sleep — in order to monitor pet health and behavior while traveling; complimentary bottle of Henry Wine for each guest that checks in with their dog as a tribute to Henry, the first canine member of the Vail Ski Patrol and iconic figure in Vail. A portion of additional Henry Wine proceeds will also be contributed to supporting the raising and training of avalanche rescue dogs. Also at The Lodge at Vail, A RockResort: pet-friendly toys, balls, bones and logo dog leashes; all-natural treats from local brewery/eatery Crazy Mountain Brewery and the Enchanted Biscuit Company; dog bowls and Sherpa-lined dog beds. A Refreshed Look at the International Wing of The Lodge at Vail, A RockResort - new carpeting and updated soft and hard goods. Private slope access through Northstar California’s Platinum Experience — Northstar Mountain’s exclusive club has expanded with access to its Platinum Terrain, an exclusive trail combining the resort’s signature grooming and highest standards for consistent, premium conditions. Skiers and snowboarders with Platinum Season or Day Passes also gain access to the exclusive run. Members unlock access to private gates at the front of each lift line -- an exclusive Lake Tahoe incentive that can only be found at Northstar. Other Platinum offerings include Platinum lockers, featuring private boot warmers and house-made sweets; Platinum tōst, a European-style lunch paired with Veuve Clicquot off East Ridge Run; and more. Begin the Day at Sunrise With First Tracks - Riders at Northstar can join the Adventure Guiding and Learning Center mountain guides for a tour of the mountain before lifts open to the public. This shamelessly indulgent experience gives private access to freshly groomed runs and sparkling powder across the entire mountain. This is what I remember about Tahoe skiing - the sensational juxtaposition of mountains and lake! Lat 38 - California Lodge’s new roof top bar, LAT 38, the ultimate posh happy hour scene. With a mountain-modern feel, cabanas, unique warm drinks, cozy fire pits and live bands, this is the best place to enjoy an après drink (eg the “Dirty Snowman”) and appetizer after a day on the mountain. Record and relive an epic day on the slopes — Riders will be toured around the mountain by a ski and ride school instructor while learning how to use a portable video camera to capture first-person video and photography of Heavenly’s secret stashes, powder pockets and stunning views. You get to keep the memory card full of the day’s footage after the lesson has ended. Request Customized On-Demand Ski and Ride School Lessons - Those riding Heavenly Mountain can now request a ski and ride coach on the fly for an ultra personalized ride down the slopes. One hour sessions available from the ski and ride school kiosk at the East Peak Lodge, with additional rides possible. TAP - Take a break in-between runs or end your day in style with a free taste of craft brew on the mountain under Tamarack Chair every day from 3 p.m. until 4 p.m. Guests will also receive coupons for discounted beers and bites at Tamarack lodge. #HelloSnow Festival - Two weeks of #HelloSnow festivities kicking off on Dec 4 and culminating with a #HelloSnow Festival Dec 16. The #HelloSnow Festival will feature three reggae bands, beer tents, local food trucks and a free VIP tent for 2017-2018 pass holders. The event lasts from 12-5 pm at the base of World Cup at the California Lodge. 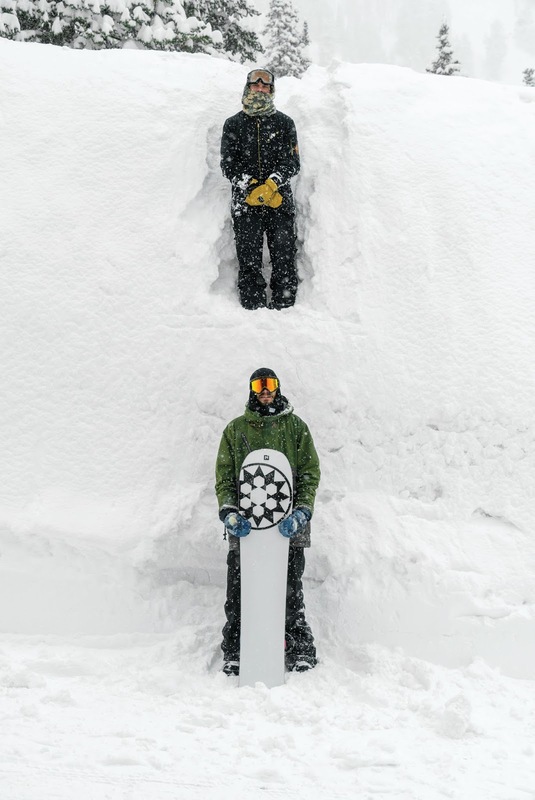 With 7,300 acres, over 330 trails, 41 lifts, 8 terrain parks, one super pipe and one mini pipe, Park City Mountain (which encompasses Canyons Resort too) offers endless high altitude adventure for every level of skier or snowboarder. I had a great time there last year just for one day and I am going back for more in March! Read about last season's adventures at: http://onetwoski.blogspot.com/2017/03/park-city-play-time.html. 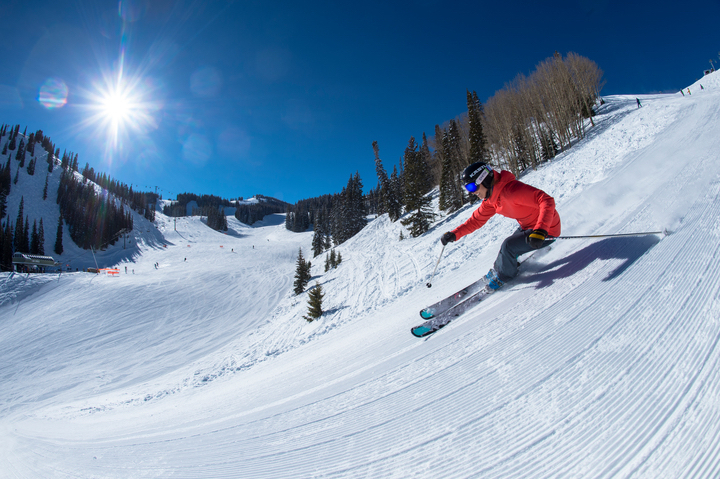 Beginner Ski and Snowboard Zone - This summer, Park City Mountain installed a new, enclosed surface lift and a new designated beginner trail to serve entry-level skiers and snowboarders at the Park City Base Area. Continued Upgrades and Investment in Snowmaking - During off-season, Park City Mountain expanded snowmaking capabilities on Treasure Hollow, a major trail near the Park City Base Area. The additional snowmaking will enhance the mountain experience and snow coverage at this location for early-season skiing as well as ensure coverage throughout the winter. $15 Million Renovation at Grand Summit Hotel - The ski-in/ski-out Grand Summit just completed its $15 million renovation which overhauled all 212 suites, the lobby, conference and meeting spaces, café and spa. As part of the renovation, the hotel joined Vail Resorts’ RockResorts portfolio — a collection of premium properties, lavish RockResorts Spas and distinctive dining options in iconic mountain locations - and became reflagged and rebranded as Grand Summit Hotel, A RockResort. DoubleTree by Hilton Hotel Park City Revamp - In addition to guest amenities like keyless entry — allowing guests to bypass check in at the front desk and head straight to rooms — and a Suite Dreams bar, DoubleTree by Hilton Hotel Park City is freshly revamped for this ski season. With everything from new roofing to new balconies to new technology offerings, this 182-guest room hotel and conference center is also enhancing guest experience with shuttle service, select loaner gear and complimentary surprise treats. Hair of the Bear Package at DoubleTree by Hilton Hotel Breckenridge - helps combat the altitude, especially needed after a night of heavy après indulgence. For $19, the package includes one session at the oxygen bar followed by a Bloody Mary, using Chili Chile Vodka from the local Breckenridge Distillery (non-alcoholic beverage available upon request). Winter Pop-Up Aprés Spa Treatments at One Ski Hill Place, A RockResort - This winter, One Ski Hill Place, A RockResort spa will offer mid-week aprés spa treatments at the Grand Living room where guests can indulge in soothing winter treatments including scalp massages, neck/shoulder massages, foot treatments, paraffin hand treatments and more. 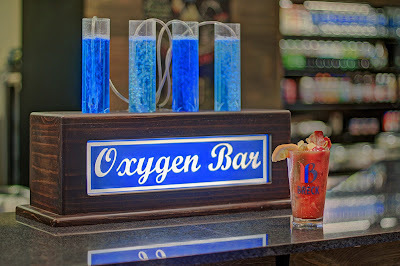 Paired with wine and/or cocktail bourbon tastings, it’s the ultimate recovery experience after a long day of hitting the slopes. Altitude Asana - New this season are warm aprés wellness offerings after complimentary 60-minute yoga classes at One Ski Hill Place, A RockResort, DoubleTree by Hilton Hotel Breckenridge, The Village at Breckenridge, Crystal Peak Lodge and Mountain Thunder Lodge. Mountain Mutt Offerings - at The Village at Breckenridge your pet will be welcomed by Bozi the dog. A Cane Corso Mastiff and Great Dane mix who is 8 years old, Bozi can be found cozying up to the warm fireplace or exploring the town of Breckenridge. Bozi provides endless entertainment for kids while parents check-in, maximizing his petting time with each guest by sitting on their feet. To greet other four-legged friends, The Village at Breckenridge provides choice of toy from Bozi’s treasure chest of dog toys; welcome treats and a personal note in room and Fit Barks to monitor dog health and behavior while traveling. It's been quite a few years since I skied at Beaver Creek but I will always remember it for the powder, unsullied - except by me - right into the pm! Also, loved staying at The Osprey, the closest hotel to a ski lift ever and full of boutiquey bonuses. Smoked & Pickled Classes at The Osprey at Beaver Creek, A RockResort - Gather around The Osprey Fireside Grill smoker for a lesson from Executive Chef Ryan Murray in the old fashioned craft-cooking methods of smoking, curing, fermentation and pickling while sipping on a smoky “Old Fashioned" cocktail (house-smoked honey simple syrup, bitters, barrel fermented 10th Mountain Rye, on the rocks in smoked-scotch misted glass). Pampered Pup Bucket List at The Pines Lodge, A RockResort - The ultimate pup-cation new package includes doggie hiking with GoPro rentals or maps for dog-friendly trails, yappy hours, spa treatments, pillow service, bed and leash, in-room doggie dining from a specifically curated menu, treats and toys, and photos during the paw print ceremony at the doggie guest book. 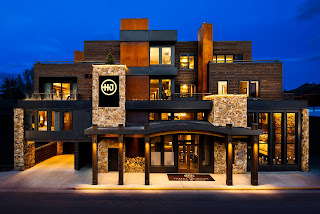 Rebranding of the Inn at Keystone - Within minutes of some sensational slopes (I was there last winter, so impressed: check it out at http://onetwoski.blogspot.com/2017/02/while-kats-away.html), the Inn at Keystone has had a full interior modern-rustic makeover and become reflagged as Hyatt Place Keystone. Among the changes are a new fitness center, an alternative grab-and-go dining option, new outdoor communal spaces, and a more functional main lobby with an open floor plan. This season, Snowmass turns 50 with season-long celebrations to commemorate this significant milestone. The resort is scheduled to host the Olympic qualifier Toyota U.S. Grand Prix event featuring the best freestyle athletes in the country. As part of the Snowmass summer expansion titled The Lost Forest, the Breathtaker alpine coaster is scheduled to open for the 2017/18 winter season. In addition, American Airlines launches new non-stop flights from Phoenix this winter and the Mountain Collective pass continues to add resorts. Looking to the future, Snowmass Base Village is under construction as the largest ski resort development currently underway in North America totaling $600 million dollars with a future 10 buildings planned at the base of Snowmass. Construction has already begun on a new 99-hotel room Limelight Snowmass due to open next season, new Four Mountain Sports store, a public plaza and a new Ice Age Discovery Center. U.S. Snowboard Team and U.S. Freeski Team athletes will be competing to punch their tickets to the Olympic Winter Games in the 2017-18 iteration of the Toyota U.S. Grand Prix. Aspen Snowmass will host five qualification events Jan. 10-14 at Snowmass. The resort previously hosted one of the first halfpipe snowboarding Olympic qualification events and a big air snowboarding exhibition event in 1998. For more information as well as the detailed schedule, visit http://ussa.org/news/olympic-spots-line-toyota-us-grand-prix. With a target opening of Dec 2017, the Breathtaker Coaster will feature a 5,700 foot-long track with a total ride time of seven to nine minutes. The coaster will span 410 vertical feet with the speed controlled by the rider, but there will be anti-collision technology for safety and a tandem option for small children. The Breathtaker will be open for both summer and winter operations, winding through the trees between Gunner’s View and Sandy Park ski trails on Snowmass Mountain. American Airlines is offering new daily nonstop flights to Aspen/Pitkin County Airport (ASE) from Phoenix Sky Harbor International Airport (PHX) starting this winter along with expanded service from both Dallas Ft. Worth (DFW) and Chicago O’ Hare (ORD). In total, American will offer up to eight daily flights from four hubs next winter while daily nonstop service from DFW will now continue throughout the fall. The timing of all these flights allows for connections from American’s entire domestic and global networks. In addition, Delta Air Lines serves ASE with nonstop daily flights from Salt Lake City, Los Angeles International Airport, Atlanta International Airport, and Minneapolis / St. Paul. United Airlines offers 20-25 daily nonstop flights from Denver, Chicago O’Hare, Houston, Los Angeles, and San Francisco International. The Mountain Collective™ continues to expand access to the world’s top resort destinations for the 2017-18 season with the addition of Northern Japan-based, Niseko United, as a global affiliate and Sugarbush, Vermont and Snowbasin, Utah as resort partners. 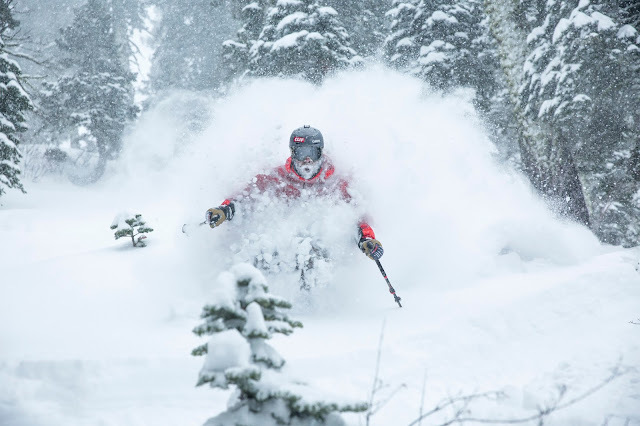 Additionally, existing partners Alta, Snowbird, Banff Sunshine, and Lake Louise will separate to operate as individual destinations within The Mountain Collective Pass, providing twice the number of days at popular destinations in Utah and Alberta, Canada. With these 2017-18 season additions, passholders will now have access to 40 days of skiing at 20 world renowned ski Destinations. For more information about The Mountain Collective Pass, visit https://mountaincollective.com/. 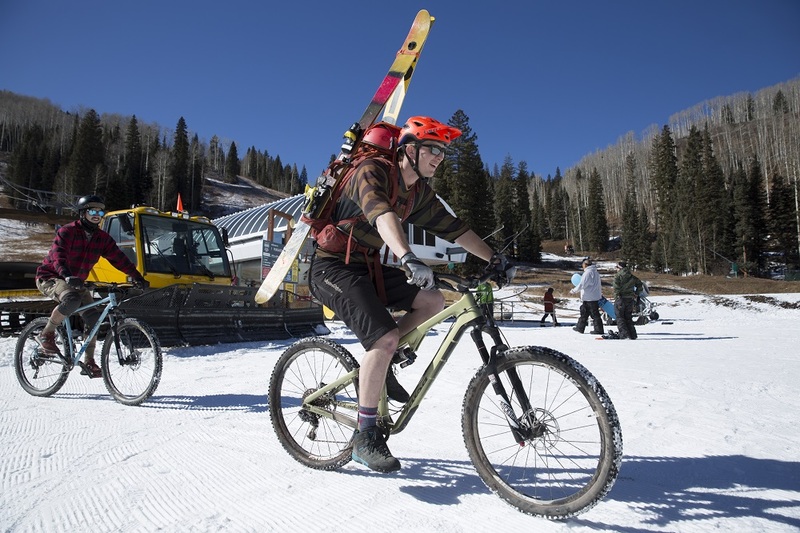 Four Mountain Sports will once again offer uphill gear to rent for skiers and riders who would like to uphill ski or skin up the mountain. New this year, the rental equipment has been upgraded to Dynafit gear, a global leader in the uphilling industry. 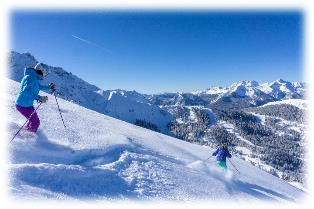 For those who don't know, uphill skiing, also known as ‘skinning’ or ‘alpine touring,’ consists of special equipment that allows guests to hike uphill on their skis and then ski down. Dynafit’s best in class rental fleet for Aspen will include SpeedFit 84 skis, Radical boots and the Radical 2 binding. For more information about uphilling at Aspen Snowmass, visit www.aspensnowmass.com/while-you-are-here/see-all-guides/uphilling-guide. In 2012, Aspen Skiing Company partnered with the Elk Creek coal mine, Holy Cross Energy, and Vessels Coal Gas on a $5.5 million investment to capture waste methane vented from a coal mine in neighboring Somerset, Colo. 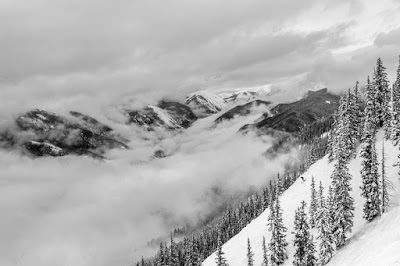 The three megawatts of baseload power generated from the project has produced as much energy as Aspen Skiing Company uses annually — approximately 24 million kilowatt hours. In addition, by destroying methane, a potent greenhouse gas, this project has eliminated three times the carbon pollution created by the resort each year. The benefit of the project—and the electricity—flows not to the ski resort, but into the grid, reducing the carbon footprint for the entire region. This project is the only one of its kind in the United States. New last season, Aspen Snowmass launched an App that offers a convenient way for guests to access mountain conditions, skiing/riding data such as tracked skier days, interactive mapping that track guests’ movement across each mountain and information such events, activities, lift tickets, lessons and more. New this year, the App will now track user’s vertical feet as well as Highland Bowl laps. This spring, Aspen Skiing Company (ASC) began construction on the new Limelight Hotel Snowmass for a scheduled completion date of November 2018. The new hotel will feature 99 hotel rooms and 11 for-sale condominiums, plus a new restaurant and children’s game area. Modeled after the company’s existing properties in Aspen, Colo. and Ketchum, Idaho, the hotel will be located adjacent to Snowmass Mountain’s Elk Camp Gondola providing ski-in/ski-out access. The new hotel property will remain consistent with the Limelight brand featuring amenities and extras such as an expanded continental breakfast, après ski deals in the Lounge, live music, adventure activities such as First Tracks and Inside Tracks, a ski concierge as well as pet-friendly rooms. Stonehill & Taylor, based out of New York City, have been selected to design the interior, with plans to continue the Limelight’s contemporary yet casual design theme. · The 99-room, 11-residence Limelight Hotel. 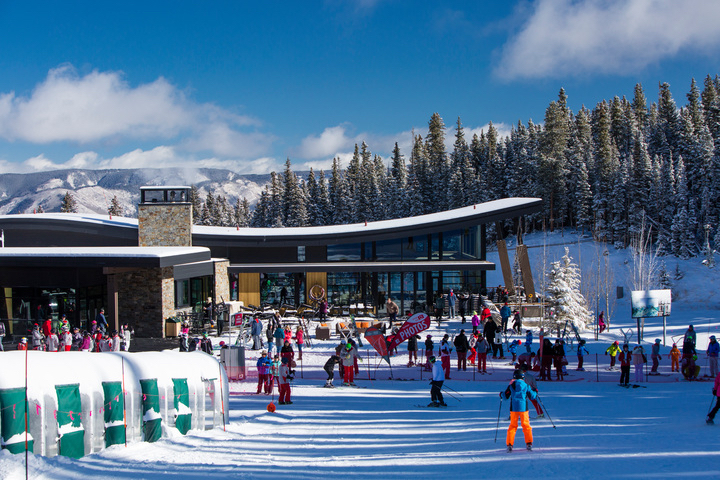 The Limelight will also host Snowmass Mountain Club, an exclusive 230-member private club with member parking, lockers and lounge space right at the base of the mountain. The mountain-contemporary building was designed by Oz Architecture, with a clean, crisp interior design approach from Stonehill & Taylor. · A central public events plaza that will serve as the community’s gathering space with an ice-skating rink in the winter and events lawn during summer months, as well as fire pits, children’s pop-up fountains and other community amenities. The plaza was designed by Oz Architecture and StudioINSITE. · A residential condominium building adjacent to the Plaza and Elk Camp Gondola with three residences and a Four Mountain Sports store. The building was designed by Oz Architecture, with interior design by The Ranch House. · The Discovery Center, a public building that is anticipated to include a number of interactive activities for families and children. Programming for the Discovery Center is being contemplated around the discovery of Ice Age fossils found at nearby Ziegler reservoir that captured the community’s and world’s attention. It is being designed by Harry Teague Architects. Best news, at least for me, is that I am going there in March and can report back on the newest highlights for 2017/18 myself! 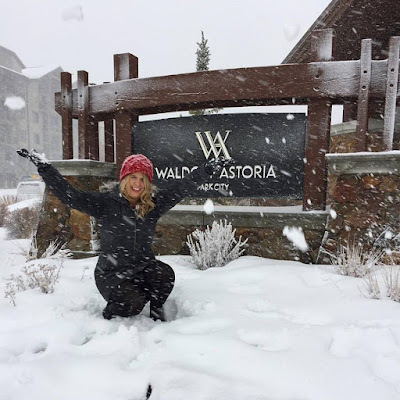 I'm starting off at the Hotel Jackson, a luxury boutique hotel in the actual town of Jackson, and then staying around town for the whole visit so that I can have the best of the ski hill by day and the razzamatazz of contemporary cowboy culture by night. 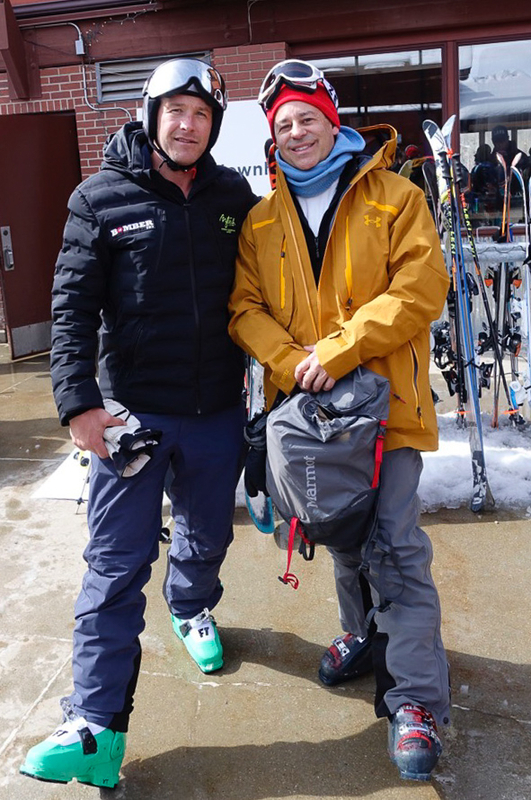 Check out my article from my previous visit at: http://onetwoski.blogspot.com/2015/02/women-only.html. Last winter was one for the record books! The resort’s 558,390 skier visits marks the third highest in resort history, after a record-setting winter in 2014 with over 563,000 skier days. The 2016/17 season finished with 593 inches of total snow, and snow depths of 158 inches in Rendezvous Bowl, marking the deepest winter in the resort’s 51-year history. The new Sweetwater Gondola, which opened in December, was part of a broader and sustained capital investment strategy to continue to ensure a world-class experience for JHMR guests. The new Sweetwater Gondola was a very popular addition to the JHMR lift infrastructure and has supported several specific objectives including a significant increase to base area capacity. In addition, Sweetwater Gondola will eventually provide access to a new and enhanced ski school facility located in the Solitude mid station area. In the continuing effort to enhance the beginner skier and family experience at JHMR, Solitude Station is the next phase of capital investment surrounding the Sweetwater Gondola. Located at the Sweetwater Gondola mid-station, the Solitude Station facility will be 12,000 square feet of ski school, rental and dining facilities. This full service facility will be completed for Winter 2018.19, and will bring to life a new center of learning and fun in Jackson Hole. With a covered surface carpet lift, top notch ski instructors and state of the art facility all accessed from a two minute gondola ride from the base, Solitude Station will be the new hub, growing the sport of skiing and riding in Jackson Hole. The building will be activated for a family après experience and private events both summer and winter. This winter fly to Jackson Hole non-stop from 12 major US cities. Non-stop routes from Chicago, Dallas, Houston, Newark, JFK, Atlanta, Los Angeles, San Francisco, Minneapolis, Seattle, Denver and Salt Lake City make Jackson Hole the most accessible Rocky Mountain destination resort. In addition, Jackson Hole airport with its recent $30 million renovation and expansion makes the arrival and departure experiences efficient and comfortable. 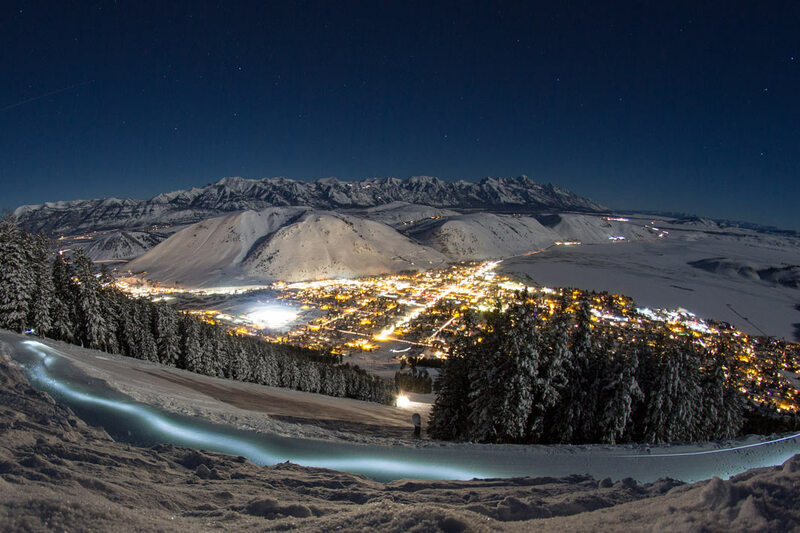 Jackson Hole Mountain Resort is just a short 30 minute drive from the terminal, now easier than ever to reach. 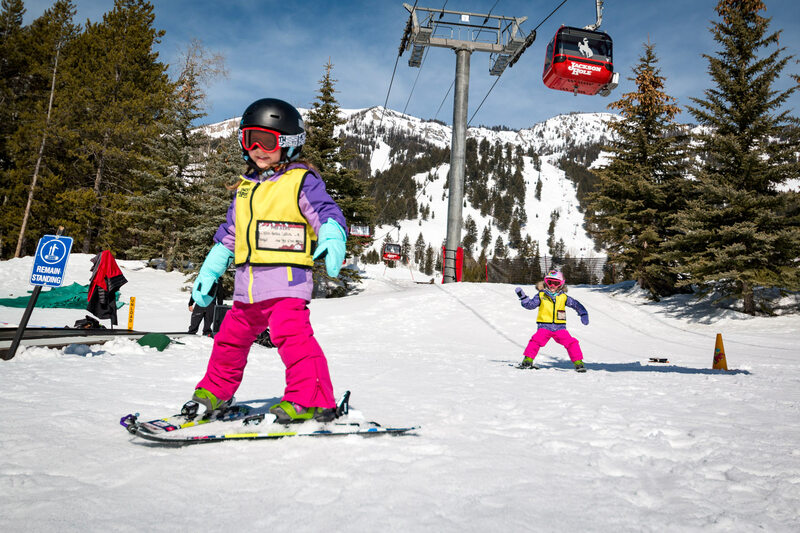 Last winter Jackson Hole Resort Lodging (JHRL) launched a Kids Ski Free program, an exclusive program to JHRL that applies to all types of vacation rentals and lodging packages. Choose any condominium or home rental for four nights or more, receive 10% off your stay, and for each paying adult, kids 14 and under ski free. New this winter, kids also rent for free with a paid adult rental. Restrictions are few in this exclusive deal for JHRL guests, and the program is valid for stays all winter except the Christmas Holiday week. Taking the new American Airlines Saturday flight from Charlotte to Montrose, I'm tackling Telluride for the first time this season! This bucket list ski destination is more accessible than ever, as more flight options have been added this winter. Dallas (DFW) will offer three flights daily over the Christmas/New Year’s holidays, complementing daily year-round jet service and twice-daily flights through the bulk of the winter season. American flights from Phoenix-Sky Harbor (PHX) will continue to run daily through the winter, along with service from Chicago (ORD) and Los Angeles (LAX). Delta Airlines will operate new flights this winter from Salt Lake City (SLC) to Montrose-Telluride (MTJ) over the Christmas and New Year’s holidays. This service provides access for those traveling from the west, as well as Delta’s eastern hubs, and is a precursor to adding a possible season-long route next year. Delta will continue to fly three times a week from Atlanta (ATL) to MTJ as well. United Airlines will run an additional daily Denver (DEN) to Montrose-Telluride (MTJ) flight, bringing that total to 4-6 per day through the season. United will also continue to operate daily flights from Houston (IAH) and Chicago (ORD), along with 1-3 flights weekly from New York’s La Guardia (LGA), Newark (EWR), Los Angeles (LAX) and San Francisco (SFO). Telluride Regional Airport (TEX), just 10 minutes from town and the ski area, will continue to see daily service throughout the year from Denver (DEN) on United partner Great Lakes Airlines, averaging 10 flights per week. Low-cost carrier Allegiant will continue service into MTJ from Los Angeles (LAX) twice a week on Wednesdays and Saturdays. 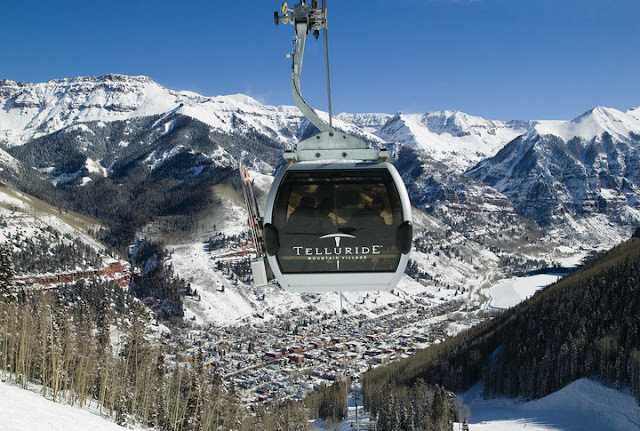 “The meaningful growth of expanded air service the past two years into both Montrose and Telluride provides our guests with even more options to make Telluride their go-to vacation destination through the holidays and the winter season and early planning ensures the best rates," said Bill Jensen, CEO of Telluride Ski Resort. This winter’s added service brings the total to 15 non-stop flights (16 over the holiday season) from 12 major hubs for the 2017-18 winter, marking an overall increase of 43% in air accessibility to the Telluride region over the last three years. ON​ ​MOUNTAIN: Telluride continues its ongoing multi-year, multi-million dollar investment in snowmaking​ ​upgrades​ and technology to improve efficiency and reduce carbon footprint. Beginners in Telluride will be greeted by a new 15-acre​ ​terrain-based​ ​teaching​ ​facility​ ​and new 300-foot​ ​magic​ ​carpet.​ Skiers will also find an expanded grooming fleet to enhance the groomed terrain across the resort. HOSPITALITY: There are ongoing refurbishments at The Peaks Resort & Spa, Telluride’s largest hotel, including new meeting/event spaces, along with upgrades and refinements to the hotel’s Spa. The Spa at The Peaks recently partnered with Naturopathica​, the New York-based, award-winning skin and body care and holistic spa treatments. The new partnership is part of The Spa’s ongoing drive to improve and enhance the wellness experience at Telluride by introducing new treatments including herbal massages, active facials and herbal remedies. Teas, tinctures and honeys that promote wellness from within have also been developed and customized for each guest. 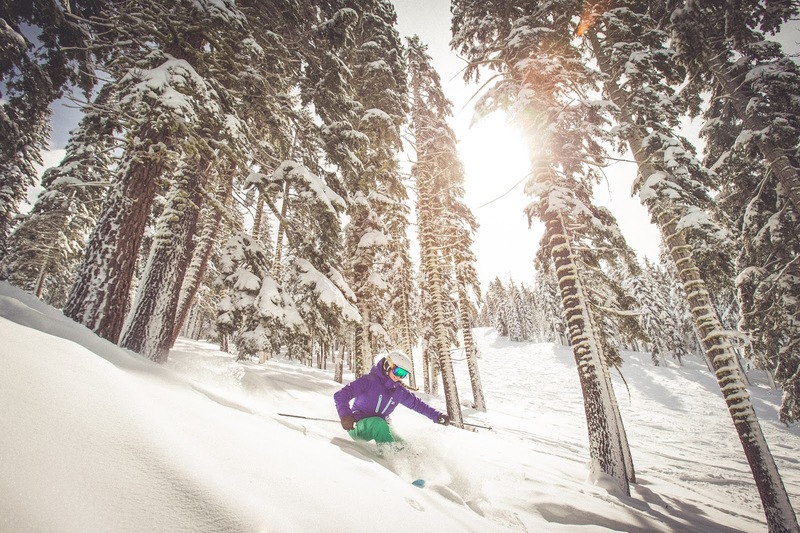 Following record-breaking snowfall in the 2016-17 season and the resort’s latest ever closing date of July 15, Squaw Valley Alpine Meadows prepared early for its Nov 17 opening day. Voted Best Ski Resort in North America by USA Today and 10 Best Readers’ Choice for the second year in a row, the resort will move forward with upgrades to snowmaking, grooming, High Camp and the mobile app. all of the essential gear and accessories for a day out on the mountain. Silvey’s Cafe on the mezzanine level of the building has been removed and converted to a family seating area, including cozy chairs and couches and a play area for kids. The location formerly known as Poolside Café will see a full interior reboot with rustic décor, and a new name: Granite Bistro, expected to open by Dec 20. Finally, the High Camp remodel will include new carpeting on stairs and hallways, updated accents and reconstruction of the Observation Deck, which is scheduled for later in the winter season. The Alpine Meadows Lodge will see a number of area improvements this season, including eight new automatic sliding doors for easier entry from the sun deck into the mezzanine level of the building, a renovated Locker Room and refurbished restrooms. Following a season where heavy snowfall posed challenges to clearing roads and parking for guests, Squaw Valley Alpine Meadows will have new snow removal machines to improve road and parking lot clearing. One new unit at Squaw Valley will have the capacity to move up to 5,000 metric tons of snow per hour. During periods of heavy snowfall, the resort will also consider the continued use of a large snow melter, similar to those used to clear city roads, which converts snow to water rather than relocating it. • Frontier Airlines will return to Reno-Tahoe International Airport after a 10 year absence withTuesday, Thursday and Sunday nonstop service to and from Denver. Service commenced Nov 21, with introductory fares as low as $49 one way. • United Airlines is now offering daily nonstop service Chicago, which kicked off on June 8, 2017. • Additional service will be added to existing nonstop destinations, including more scheduled flights to Denver, Chicago and Houston on United Airlines, Long Beach on JetBlue, and Los Angeles on Allegiant, to name a few. 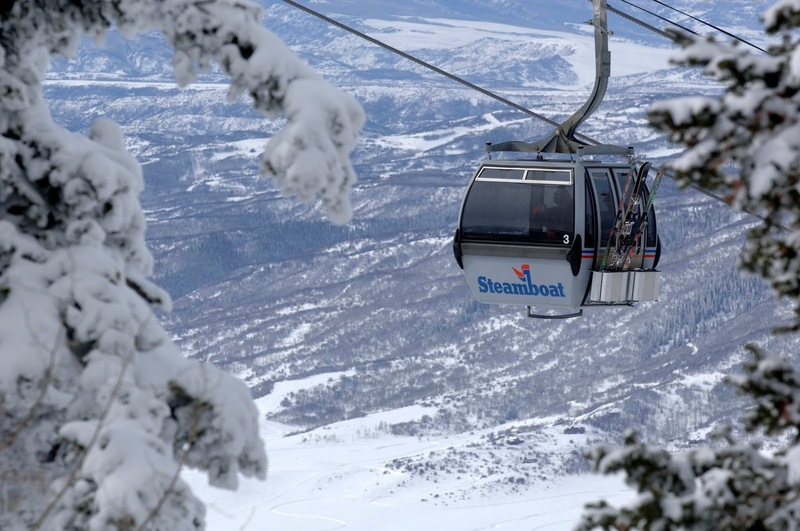 A summer of behind-the-scenes changes sets Steamboat up for another successful season. The biggest news for the resort was the finalization of the sale of all Intrawest properties, including Steamboat, to a newly formed company headed by KSL Capital Partners, LLC (KSL) and Henry Crown & Co. (HCC). The yet-to-be-named new company will bring together 13 industry-leading resorts from across North America, including Steamboat, Mammoth, Squaw/Alpine and Deer Valley. On July 31, KSL and HCC completed the purchase of Intrawest and Mammoth Resorts to create a new company featuring 13 industry-leading resorts across North America plus Canadian Mountain Holidays (CMH). 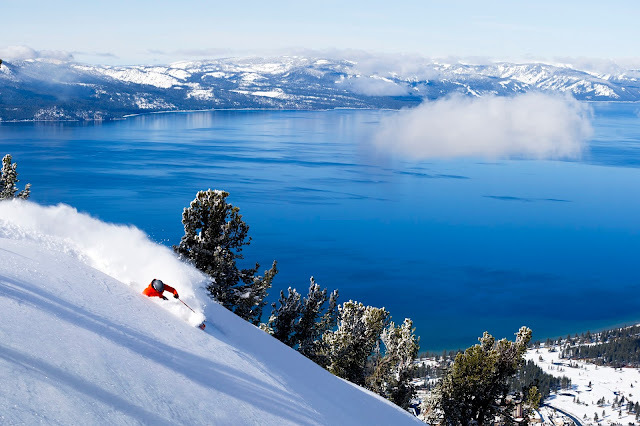 The new family of resorts features all former Intrawest resorts — including Steamboat, Winter Park, Tremblant, Blue Mountain, Snowshoe and Stratton — as well as Squaw/Alpine Meadows, Mammoth Mountain, June Mountain, Bear Mountain and Snow Summit. 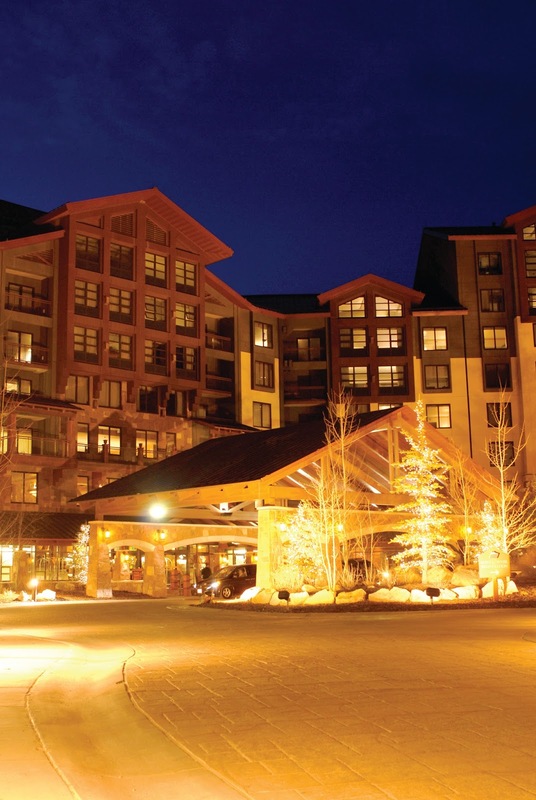 In August, the new company formed an agreement to purchase Deer Valley Resort. For the 2017/18 winter season, resorts will continue with business as usual, with new company announcements regarding passes, upgrades and more being communicated in the near future or as they become available. New ViaAir nonstop flights: Two new nonstop flights from Austin (AUS) and Kansas City (MCI) make travel to Steamboat/Hayden(HDN) even more accessible for the 2017/18 winter season. Added dates and bigger planes: From Denver, United Airlines will add an additional daily flight, now offering three per day throughout the entire season and four daily flights from Dec. 20 to Jan 7 and Feb. 15 to April 2. United also expands to daily service from Chicago for the entire winter season. American Airlines will bring passengers into Steamboat on bigger planes during the holiday season from Dec. 15 to Jan. 7 with two flights per day during the week and three flights on the weekends on 737-800 planes. Automated snow stake: Snow reporting is one of the most popular pieces of information snowsports' enthusiasts seek, and Steamboat steps up its industry-leading accuracy with an automated snow stake recording the resort’s official mid-mountain snow statistics as well as snowfall at the summit. Working with Campbell Scientific, a leader in the automated weather recording industry, Steamboat installed sonic ranging sensors to measure reliably snow depth and accumulation. In addition, weather stations across the mountain monitor wind speed and direction, air temperature, relative humidity, barometric pressure and precipitation. For the third season out of four, I'm skiing in Utah this winter. The Qualtrics' conference - called Qualtrics Experience Week for 2018 - brings me back with hubby, Dr Simon Hudson, who is always invited as a conference delegate. As well as amazing motivational speakers such as Michael Lewis and Michael Phelps in March 2017, the conference hosts an amazing concert just for the delegates and hangers-on - Elton John this year and Maroon Five next year! 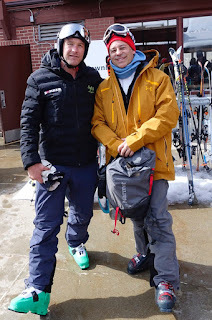 - and, more importantly, a sensational ski day at the end of the week - Bode came in March and skied with us! Salt Lake City attracts many conferences and events like this and delegates are always keen to add on extra ski days, particularly as there are 14 very different ski resorts, really close to the airport. With fabulous snowfall last year, Utah earned another record-breaking season of 4.58 million visitors, outdoing its previous record by three percent. 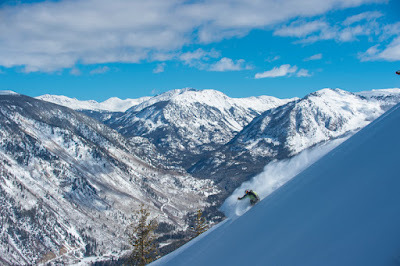 Deer Valley Resort has been acquired by a newly formed resort company, joining Intrawest, Mammoth Resorts, and Squaw Valley Ski Holdings. This acquisition increases the company’s portfolio from 12 four-season resorts to 13. Deer Valley will continue to honor existing season pass and multi-resort products, and operations will continue in ordinary course for the full 2017-18 winter season. Also, at this time there are no plans to allow snowboarding. 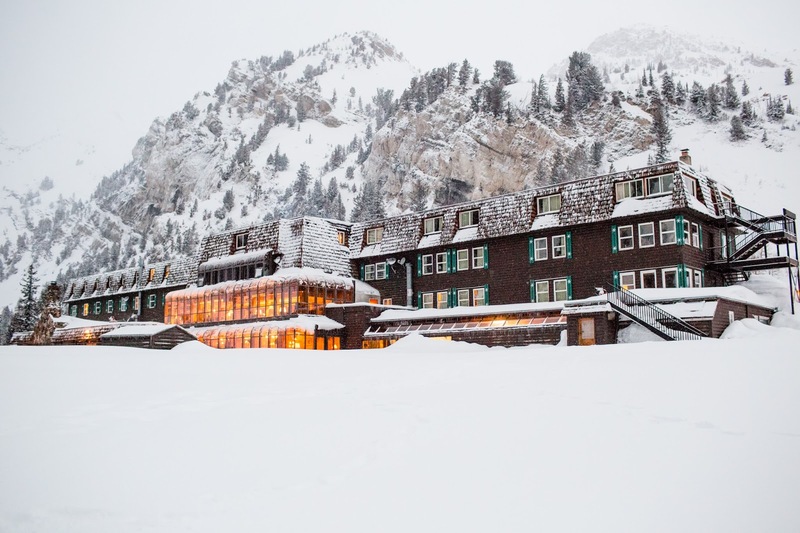 Snowbird's newly remodeled The Creekside Lodge will open at the start of the season. Snowbird has increased its available space for guests by adding over 13,500 sq. feet. The new facility will be home to the Mountain School as well as ticketing, and expanded dining options including a boosted breakfast menu and barista-powered drinks, all just steps away from the lift. Alta Ski Area has replaced Supreme and Cecret lifts with a new high-speed quad chairlift, named Supreme. The lift’s updated technology and new base location, near Alf’s Restaurant, will improve overall mountain flow for all levels. Snowbasin is replacing the old Wildcat triple chairlift with a new high-speed detachable six-pack lift. The chairlift ride will be a quick five minutes and will rise over 1,290 vertical feet. Additionally, Snowbasin is increasing snow making in the Wildcat area, which will allow the resort to utilize beginner and intermediate terrain more frequently and earlier in the season. As one of the first resorts to cap day passes and season passes, Powder Mountain is a one-of- a-kind destination hanging its hat on skier experience and adventure, set among a modern village development. 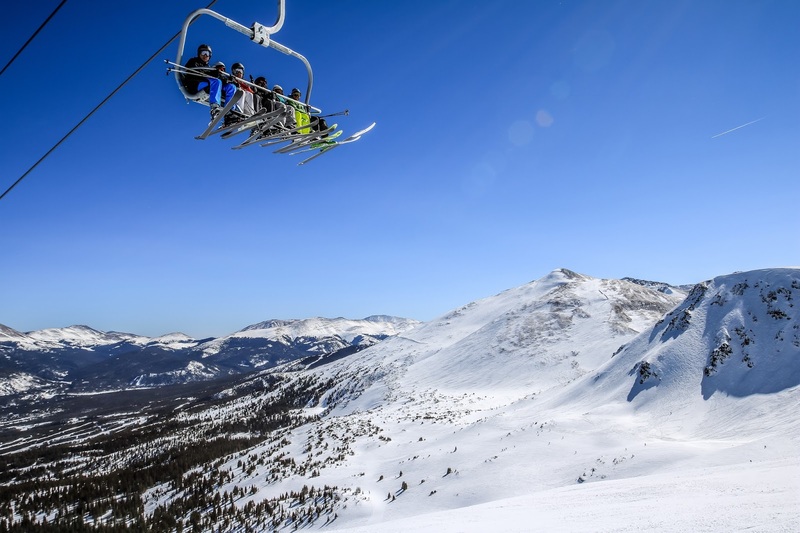 With the addition of two new lifts last year, the throwback mom and pop style resort boasts the most skiable acres in North America with 8,464 acres. This year the resort is Preserving the Pow experience by capping day passes at 1,500 and season passes at 3,000, which averages three skiers per acre. This summer, Park City Mountain installed a new, enclosed-surface lift and a new designated beginner trail to serve skiers and snowboarders at the Park City Base Area. The new area will provide a comfortable and spacious learning area for those just starting to ski or ride. Solitude Mountain Resort invested $1.5 million in improvements for the 2017-18 season, including a website re-launch, and continued improvements to the Roundhouse Restaurant, Last Chance Lodge and Moonbeam Lodge. This is all in addition to realigning the Solitude portion of the SolBright connection trail and adding a new Rossignol rental fleet at the Nordic Center. This season, Brian Head Resort is launching its first fully interactive app that will include powder alerts and condition reports, and will allow users to track their ski day (runs, vertical skied, etc). The app allows users to follow their children at ski school and access restaurant specials and more fun resort offerings. Sundance Mountain Resort is opening a new outfitter shop, Sundance Mountain Outfitter 2. Located feet away from the base of Jake’s Lift, it is a one-stop shopping destination for all recreation needs with top-of-the-line skis and snowboards available for rental, as well as a full-service ski and snowboard repair center. If you’ve got limited time, fly into the Ogden-Hinkley Airport. This small airport, serviced by Allegiant Air, is located five minutes from downtown Ogden and will be adding new flights from Los Angeles (LAX) and Las Vegas (LAS) this fall. 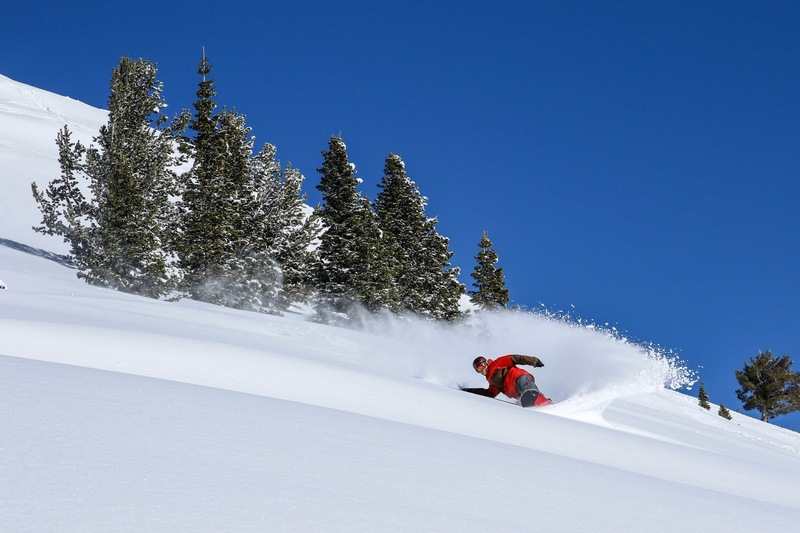 Scheduled Thursday through Monday with starting prices at $35 each way, this is a great option for the weekend warrior at Powder Mountain, Nordic Valley and Snowbasin. Alta Ski Area is celebrating its 80th anniversary this winter, making it the oldest lift-serving resort in Utah. 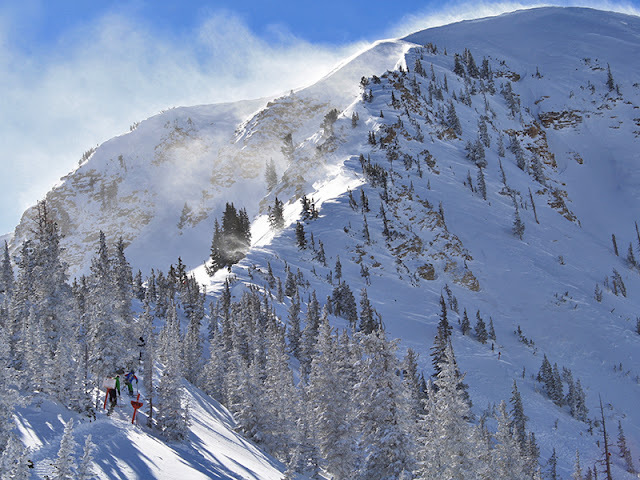 Located just outside of Salt Lake City, Alta is covered by 550+ inches of The Greatest Snow on Earth annually. While known for their expert terrain, Alta is a wonderful place for families to learn and ski together with over 25 percent of the resort featuring beginner terrain and over 40 percent featuring intermediate terrain. Nordic Valley is celebrating its 50th anniversary this winter. Built in 1968, Nordic Valley is known for the family friendly atmosphere and small-resort feel. 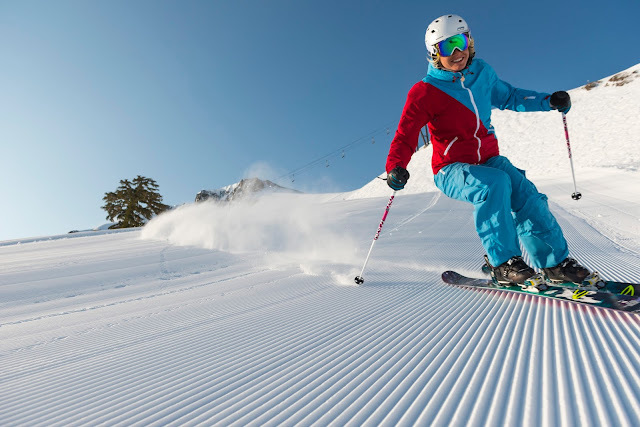 Situated between Snowbasin Resort and Powder Mountain, Nordic Valley offers a variety of skill levels to accommodate each skier and snowboarder. Nordic Valley also offers night skiing, with 100 percent of the mountain under the lights. The Grand Summit Hotel, located in Canyons Village at Park City Mountain, is open for the season after an extensive $15 million renovation and is now flagged as a RockResorts property. The renovation included a complete overhaul of all 212 suites, including new interior finishes, furnishings, soft goods, appliances, artwork and technology. Snowbird’s Cliff Spa, located on the rooftop of The Cliff Lodge, has undergone a massive renovation just in time for the upcoming ski season. The famed outdoor pool and hot tub have been upgraded with sensual surroundings of new radiant heated decks, gas-fed fire pits, and expanded communal areas prime for relaxing after an adventurous day on the slopes. 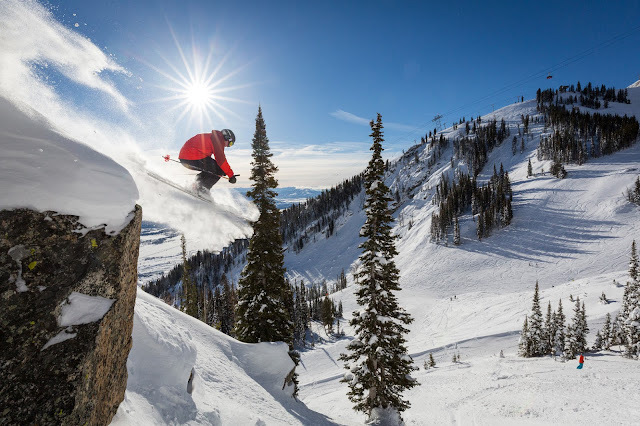 Skiers who require more hands-on Cliff Spa services, will be treated with new interior upgrades such as eucalyptus infused environments, ergonomic flooring in massage rooms, and a unique offering of Utah-Only essential oils in the Cliff Spa boutique. Deer Valley Resort was selected to manage the Goldener Hirsch Inn and Residences, effective July 2017, assuming management of both the existing Inn and the new residential development that is currently under construction. The Goldener Hirsch Inn is an award winning, boutique hotel located in the heart of Silver Lake Village. It features 20 condominiums that operate as hotel rooms, as well as common area amenities such as conference rooms, outdoor hot tub, ski storage and the acclaimed Goldener Hirsch restaurant. Stein Eriksen Residences, the latest addition to Stein Collection, are now taking guest reservations for the 2017-18 winter ski season. 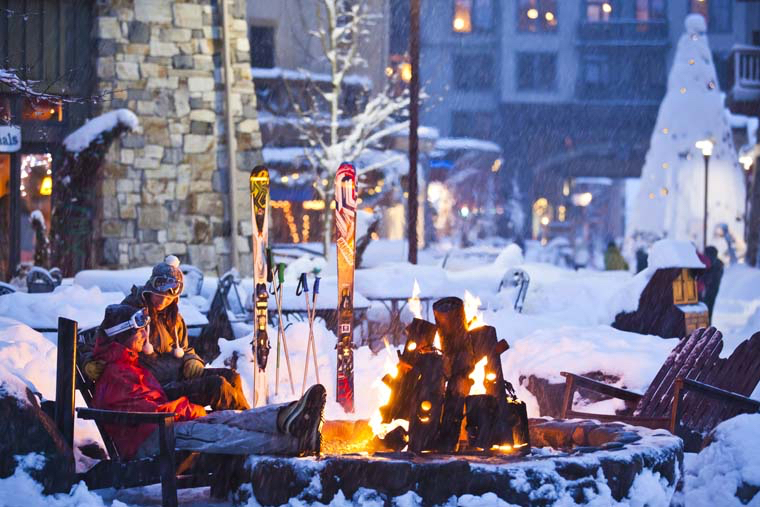 Located mid-mountain at the world-renowned Deer Valley Resort, Stein Eriksen Residences offer 15 distinct mountain homes and 39 elegantly appointed condominiums, comprising the finest lodging experience in all of Park City. The ski-in/ski-out Stein Eriksen Residences balance contemporary and traditional design throughout the property, offering amenities including a stunning mountain view and town vistas, the 7-8-8-0 Club on-site restaurant, Silver Aspen Spa, indoor/outdoor infinity pool and terrace with indoor/outdoor hot tubs, a lounge area with fire pits, indoor kids splash pad, state-of-the-art fitness center, and a ski shop, valets, lounge and locker room. Newly renovated and celebrating its 126th year, The Bigelow Hotel, formally known as The Historic Ben Lomond Hotel, has returned to its roots. Located in the heart of downtown Ogden, this hotel will take you back in time with its grandiose lobby and 1920’s art-deco look and feel. The Alta Peruvian Lodge has converted seventeen “Nordic” rooms on the third floor to ten “Superior” rooms. The new rooms have two queen beds and a private bathroom, providing more options for families. Treasure Mountain Inn, on Historic Main Street in Park City is under new management. Club Lespri, a Park City based property management-company, will manage and operate the property. The acquisition is a win-win for property owners at Treasure Mountain Inn and guests to Club Lespri’s other properties. 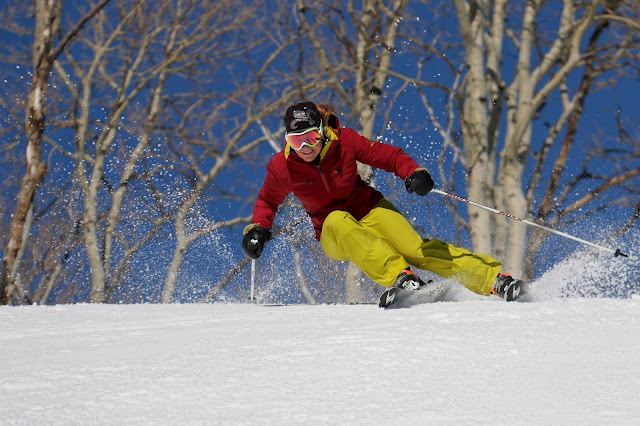 Snowbasin Resort is expanding its snow sports offering for adults. The new three-day camp conquers the steeps of Snowbasin Resort, host of the speed events in the 2002 Olympic Winter Games. Through the Ski With a Champion program, Deer Valley Resort’s Ambassador of Skiing, Heidi Voelker, invites you to ski with her or one of six other Olympic snow sport athletes this winter. The athletes are available to ski with individuals, families and groups for exclusive half-and full-day memorable adventures at Deer Valley. Participating in the Nordic Center Ladies Day at Sundance Mountain Resort is a great way to stay in shape during the winter months in an environment that is fun and friendly, safe, and affordable. This is a program by women for women and for participants of all levels, whether you are looking to try cross-country skiing for the first time, or wanting to build on existing skills. The new co-ed Alta Breakthrough Camp is targeted towards intermediate skiers, and beyond, who are ready to take their skiing to the next level. 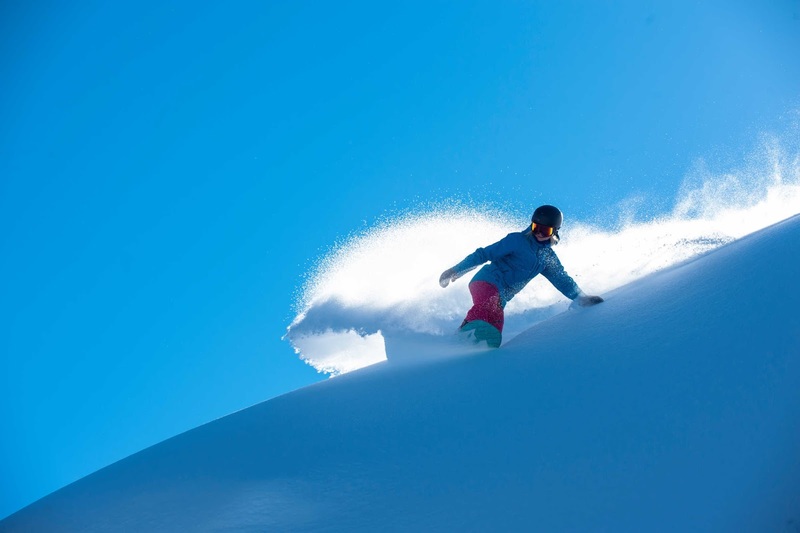 The package includes four nights lodging at the Alta Lodge, full breakfast and dinner daily, three days of instruction with top coaches from Alta’s Alf Engen Ski, lift tickets and demo skis. 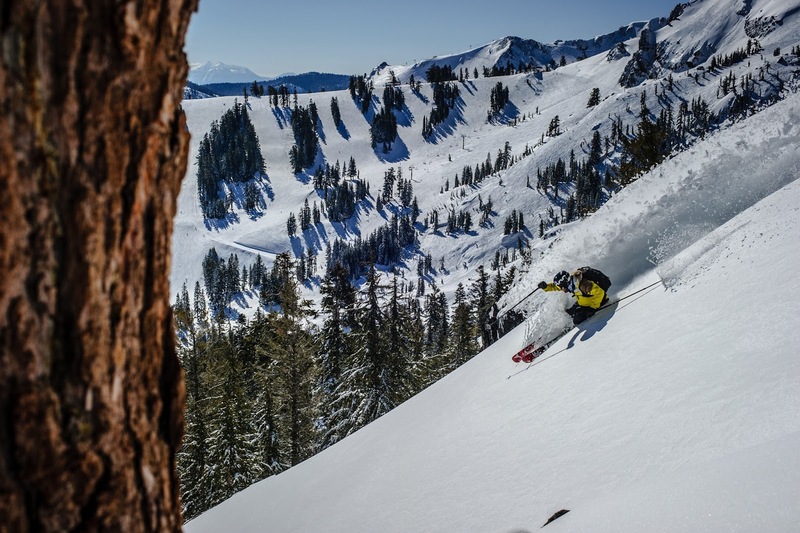 Utah is the only place in North America where skiers have access to the Rossignol Pursuit – Strato skis. 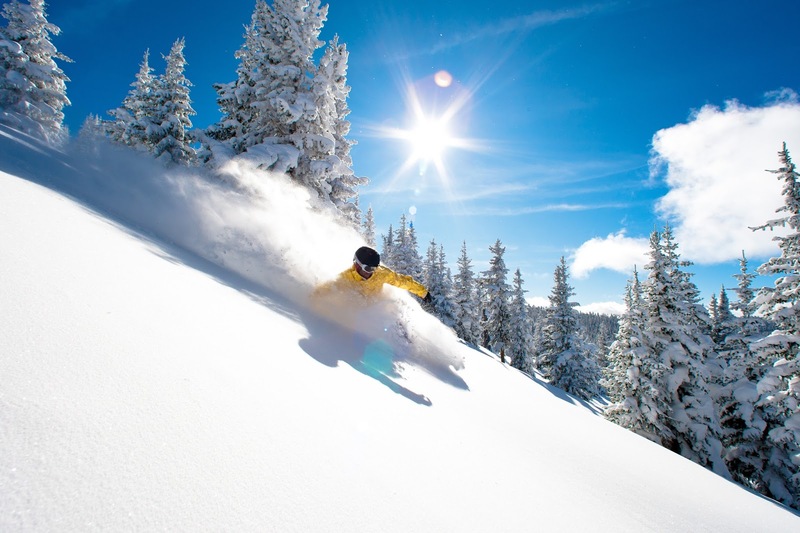 Through Ski Butlers, a Park City based company, the Waldorf Astoria Park City offers guests exclusive access to ten pairs of these skis, which are perfect for carving beautiful lines into that freshly groomed Park City Mountain. Ski Butlers also offers hotel guests a new level of service and convenience. New this year, Solitude Mountain Resort is offering a program called Women on Wednesdays (WOW), for women who seek camaraderie, challenge and a great learning partnership. The program is available to all skill levels and taught by Solitude’s professional female instructors. The Montage Deer Valley is expanding its Montage Expeditions program with excursions to Yellowstone National Park. 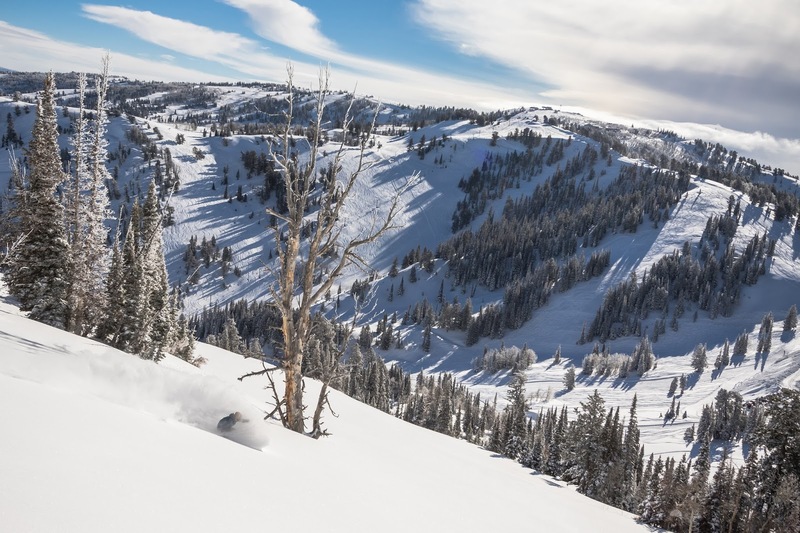 The program launched last year, allowing guests to ski the famed slopes of Deer Valley while also visiting one of Utah’s national parks, all in one stay. Guests can take a once-in-a-lifetime day trip adventure to southern Utah led by a Montage guide, complete with private flight aboard a Pilatus-12 and a gourmet chef-prepared lunch. Unlock the secrets of the past and discover Park City’s rich mining, skiing and local history on the Silver to Slopes Historic Mining Tour on Park City Mountain. On this free, guided ski tour, explore the mountain with an expert guide and uncover the historic mining buildings and hidden relics scattered across the resort. The Waldorf Astoria Park City is now offering a way for everyone in the family to live out their dreams of being an Olympian. Guests of the hotel will have an opportunity to visit sites from the 2002 Olympic Games with a professional athlete, such as Olympian Nate Roberts, with options to ski at Park City Mountain and/or bobsled at the Utah Olympic Park. 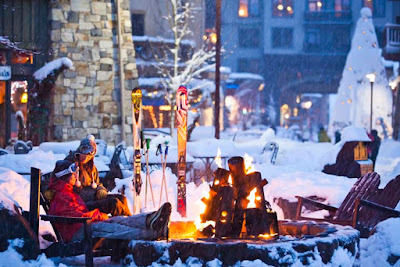 The day ends with a gourmet dining experience with their athlete from the chosen sport at Waldorf Astoria Park City’s acclaimed restaurant, Powder. The Montage Deer Valley is offering a new program called Montage Generations where families have the opportunity to choose from an array of educational and adventurous activities including tubing, cooking classes, snowshoeing and more. This variety seeks to engage all generations of the family and provide meaningful experiences, to be cherished for years to come. At Stein Eriksen Lodge, guests and their families can participate in a family-friendly year-round scavenger hunt that takes them to some of the best attractions in Park City. Kids can earn special stamps and buttons for each activity completed and/or visited throughout town. If they collect all 10, they receive a Stein’s Gold Medal and a complimentary one-night stay for a future visit. New this year, Alta Ski Area is offering a season-long Saturday program for novice skiers age 9-14 called Alta Explorers. Participants will practice fundamental skiing skills and progress toward parallel turning and speed control on more difficult blue trails. For the 20th year, Deer Valley Resort will be hosting the FIS World Cup events from January 10-12, 2018. What makes this year so unique is that the competition will be an Olympic qualifier for this year’s 2018 Olympic Winter Games and Olympic athletes could be named to national teams at this event. Park City Mountain is making the Holidays even more special for guests by hosting unforgettable signature events this Christmas, New Year’s and Spring Break. The Holiday Season kicks off on Dec. 16, with Park City Mountain’s annual Snowfest Celebration, a 16-day festival including morning and après musical acts, village entertainers, the annual torchlight parade, fireworks and a special visit from Santa on the Town Lift. Park City Mountain’s annual Spring Grüv Celebration will return just in time for Spring Break this March with 16 days of free concerts and the famous Pond Skimming Contest. Utah’s resorts are committed to mitigating their environmental impacts and protecting their communities for future generations to enjoy. Utah’s resorts are involved in multiple initiatives that address their responsibility to the environment including policies to reduce emissions generated by operations, championing local food, carpool and public transportation incentives, recycle programs and educating guests on how they can help. For more information click here. The town of Park City has set the nation’s most ambitious climate goals with a pledge to be net-zero carbon for municipal operations by 2022 and net-zero carbon community wide by 2032. In moving forward with this promise, Park City launched six zero-emission electric buses to the already free public transit system throughout the town. Also, this summer Park City became the first town in North America to operate an all-electric bike share program and has distributed 89 electric bikes at six locations throughout Park City. Salt Lake City also instated the Climate Positive 2040, which pledges to use 100 percent renewable energy by 2032 and also plans to reduce carbon emissions 80 percent by 2040. This commitment makes Salt Lake City one of only a handful of cities worldwide to make a pledge of such a significant size. For more information click here. 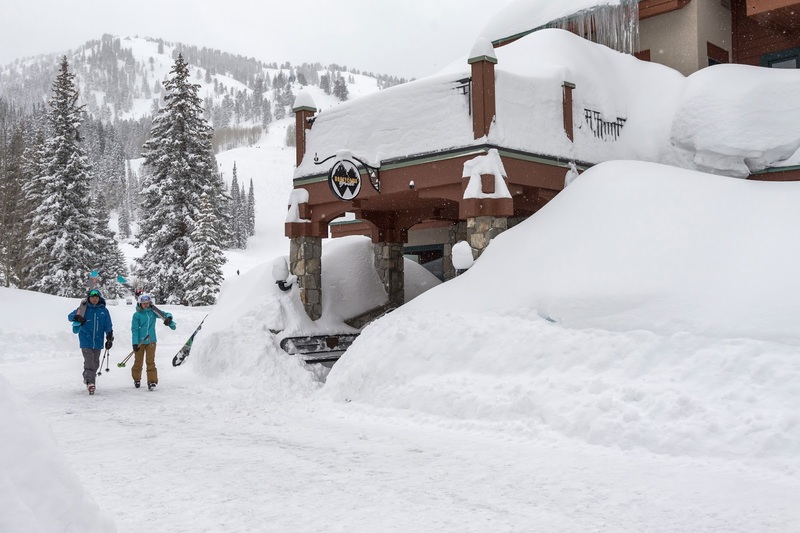 Utah Transit Authority has continued working with the local resorts and municipalities to make significant improvements to the ski bus service feeding Alta, Brighton, Snowbird and Solitude resorts. The service now includes more frequent times during peak hours, increased parking capacity and improved connections to TRAX and FrontRunner. Season Pass holders and those who purchase Ski City Super Passes can ride the UTA ski bus for free.